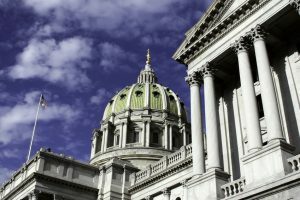 HARRISBURG: Governor Tom Wolf pushed the Transgender Bathroom Bills in Harrisburg. It had bi-partisan support and opposition. Many citizens rose up to oppose these measures, led by the group “Protect My Privacy.” The pressure became so great that the politicians pulled out an old trick—they split up the bills trying to get them passed piecemeal. Thus far it has not worked. Citizen demonstrations and visits to the legislators has had an effect. Not only will these bills harm our wives, daughters, and grandchildren’s privacy in the bathroom, but they also include showers and other accommodations (rooms on trips) and may kill women’s athletics. Stay tuned to this. SCHOOL REAL ESTATE TAXES PART 1: Last November SB76, the School Real Estate Tax Elimination Act failed in the Senate by a 24 to 24 vote with the Lt. Governor casting the deciding no vote. However, there has been movement for a re-vote on this issue. The group Pennsylvania Liberty Alliance out of Bethel, PA, has been very active bringing political pressure for that second vote. PLA has been visiting politician’s neighborhoods talking to the politicians constituents, informing them of the benefits of the bill and how their representative voted. Then they take out Ads in the local newspapers telling the people about the politician’s record. Finally, they hold town-hall meetings with the citizens and the politician. This has had a great effect on the politician’s outlook on the bill, holding their feet to the fire. We may well see another vote on this important bill in the near future. SCHOOL REAL ESTATE TAXES PART 3: The Lower Merion School District was ordered by Montgomery County Court Judge Joseph A Smyth to repeal its 4.4% Real Estate Tax hike, due to the fact it was over and above the State Limit imposed by Act One. How did this come about? Attorney Arthur Wolk filed suit against the district and its tax hike. Wolk argued that for several years LMSD under estimated revenues and over estimated expenses at budget time creating a false impression that a tax increase was needed to balance the budget. But at the end of the year there was surplus that was added to the Reserve Fund. Wolk argued that this was done repeatedly for over six years creating a 55 million dollar Reserve. Furthermore, the district had available reserves large enough to keep any tax increase within Act One requirements OR the tax increase was not even needed. Judge Smyth agreed and ordered LMSD to repeal the tax increase and or keep it within Act One Requirements. LMSD is appealing this decision and School Districts across the state (and the Department of Education) are monitoring this closely, because the scam has just had its “apple cart” over-turned. AGAIN—SCHOOL DISTRICTS ALL OVER PENNSYLVANIA HAVE ACCUMULATED OVER FOUR BILLION DOLLARS IN RESERVES! That is taxpayer money. Think of all the thousands of Pennsylvanians who have lost their homes due to this SCAM! KUDOS TO JUDGE JOSEPH A. SMYTH for looking after Pennsylvania’s citizen taxpayers.